When you set up a consultation appointment with a doctor, think of it as an interview. Don’t worry, doctors are also ‘interviewing’ you to determine if they can help you. To scrutinize prospective doctors, this list of 10 questions will solicit the information you need to select the best doctor (cardiac electrophysiologist) for your type of A-Fib and your treatment goals. Our coordinated worksheet lists the 10 questions with space for a doctor’s answers. Just download the PDF file “Questions for Doctor’s” Worksheet (and save to your hard drive). Then, print a worksheet for each doctor you interview. Familiarize yourself with these questions before your interviews. Afterwards, use this page to compare the doctor’s answers to typical responses and what each response may mean to you. (File your worksheets and other notes in your A-Fib binder or folder for future reference—later you might want a second opinion). 1. 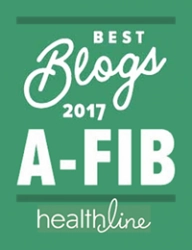 What treatments do you recommend for dealing with or curing my type of A-Fib? If the doctor only talks about different medications, you should probably talk to other doctors on your list. Overall, Drug Therapies have poor success rates, and don’t address the progressive nature of Atrial Fibrillation. Think of a consultation as an interview. Don’t worry, doctors are also ‘interviewing’ you to determine if they can help you. 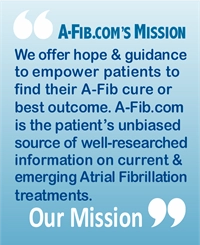 Today, the best and least invasive A-Fib treatments are RF Catheter Ablation and CyroBalloon Catheter Ablation. 2. 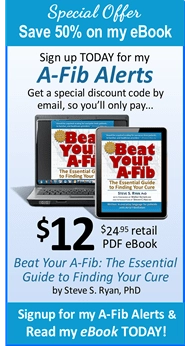 Do you perform Catheter Ablation procedures for my type of A-Fib? What methods or techniques do you use or prefer? Translation: These responses indicate a doctor may not have the experience or be comfortable working in the left atrium. Though it’s more difficult to work in the left atrium, most A-Fib comes from the left atrium pulmonary veins. You may have Atrial Flutter in your right atrium along with your A-Fib, but it may well be triggered by the A-Fib coming from your left atrium. You should probably talk to other doctors on your list. Translation: Though this used to be one of the most common treatments for A-Fib, you don’t want to be burdened with a permanent pacemaker for the rest of your life when there are better options available. Also, this procedure leaves you in A-Fib and dependent on medication for the rest of your life. Unless you have a Sinus Node problem and need a pacemaker, you should probably talk to other doctors on your list. Translation: All good answers. Circumferential, Segmental, Anatomically-Based Circumferential (also referred to as Left Atrial Ablation) and Pulmonary Vein Antrum Isolation (PVAI) are refinements or different Pulmonary Vein Ablation procedure strategies. 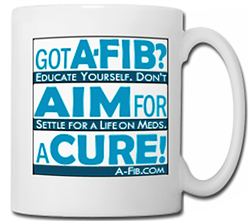 All offer you a good chance of being cured of your A-Fib. Circumferential is the most used technique. This response indicates the doctor and/or medical center is targeting specific spots generating the A-Fib signals. This technique, first called Focal Catheter Ablation, was the first technique developed to ablate A-Fib. Today you may hear the terms Pulmonary Vein Isolation/Ablation, PVI/A or Pulmonary Vein Antrum Isolation (PVAI). However, most centers today use either Circumferential or Segmental techniques to first ablate or isolate the entire area around the openings of all four Pulmonary Veins. If the A-Fib signals persist, then they’ll proceed to target and abate the specific source of the ectopic beats. Translation: This response indicates the doctor and/or medical center are versatile and can use either or both techniques to find and ablate your A-Fib signals. The safety and effectiveness of RF catheter ablation and Cryoballoon catheter ablation are similar. EPs have been doing RF ablations for decades. It works. The CryoBalloon Ablation (FDA-approved in 2010) is a relatively new method of ablation without a long-term track record. Both are low risk procedures. Warning: stay away from EPs who only do CryoBalloon ablation. Some EPs, with no expertise with RF catheter ablations, are now doing CryoBalloon ablations because they’re easier (i.e. less demanding) and faster to perform (more lucrative). What’s important: Not the type of ablation you choose, but rather the skill, expertise and experience of your EP. Major centers with a lot of experience have a success rate of around 70%–85% for Paroxysmal A-Fib (and a higher success rate of 90%–95% if a second ablation is necessary). If their success rate is 50% or less, you should probably look elsewhere. If you have Persistent or Long-standing Persistent A-Fib, you have to be prepared to have at least two ablation procedures. 4. How long have you been performing catheter ablations for my type of A-Fib and how many procedures do you perform a year? There are many electrophysiologists (EP) and several medical centers that have been doing Pulmonary Vein Ablations for years and have done hundreds (or thousands) of Pulmonary Vein Ablations. 5.“What do you do if I’m still in A-Fib at the end of the ablation procedure? (and save to your hard drive). Print a worksheet for each interview. Translation: This is NOT the answer you want to hear. A doctor who leaves a patient in A-Fib and shocks them back into sinus rhythm may be remiss and just wants an easy way to wrap up the procedure. Run, don’t walk, to another EP. Response #2: “I’ll look for non-PV triggers using computer mapping technology and then ablate those areas. Translation: This is the type of answer you want to hear. Not all A-Fib signals originate from the Pulmonary Veins, but most do. That’s why doctors ablate the openings to the PVs first. Response #3: “I’ll use a drug to stimulate the areas of your heart that are capable of producing A-Fib signals, then ablate those area. Translation: Again, this is a perfectly acceptable answer. The EP is on the hunt to ablate your non-PV A-Fib signals. 6. 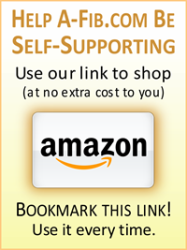 What kind of complications have you had after ablations? Every A-Fib doctor has had some complications when doing Pulmonary Vein Ablation procedures. A catheter ablation is a low risk procedure, but it is not risk free. Possible complications include blood clots and stroke, PV Stenosis (post-op swelling of pulmonary vein openings which can restrict blood flow and lead to fatigue, flu-like symptoms, and pneumonia), Cardiac Tamponade (pooling of fluid around the heart that can cause a drop in blood pressure) and Phrenic Nerve Paralysis (related to the diaphragm, and usually temporary). Doctors and their office staff are usually very open about the complications they have had and can usually give you statistics. If they are not, you may want to look elsewhere for your doctor. A doctor’s use of technology may improve their effectiveness compared to other doctors or medical centers. Examples: Using an imaging system that gives 3-D images of the inside of the heart, of the position of the esophagus, and of catheter placement and pressure; Using an energy source like the CryoBalloon catheter system to produce circular lesions around the pulmonary veins; Using magnetic or robotic arms that aid in more precise placements of lesions or ablations. Damage to the esophagus during an ablation (called Atrial Esophageal Fistula) is a very rare complication (less than 1 in 1000+), but is often fatal. Heat from the RF catheter damages the esophagus which lies just behind the heart; then over the next 2–3 weeks, gastric acids can eat through the weakened area. Doctors and medical centers take precautions to avoid this damage including prescribing Proton Pump Inhibitors to prevent gastric acid damage. If you don’t get answers like these, especially about taking Proton Pump Inhibitors after an ablation, it might be wise to talk with other doctors. 8. 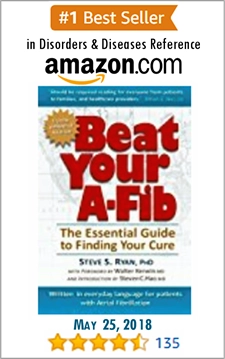 Do you ever refer your A-Fib patients for Maze or Mini-Maze surgery? Some A-Fib patients might be better served by a Maze or Mini-Maze surgery. For example, someone who needs open heart surgery for another problem might well combine that surgery with a Maze operation. Someone who can’t tolerate warfarin (brand names Coumadin and Jantoven) or other blood thinners might turn to a Mini-Maze surgery. Most Mini-Maze surgeries are the result of referrals by electrophysiologists. 9. (For female patients) What is the extent of your training specifically related to women’s heart health? Women tend to have different symptoms of heart disease than men, in part because their bodies respond differently to risk factors such as high blood pressure. Cardiologists who specialize in women are more common than ever. Medical centers now have clinics devoted to women’s heart health. Women with A-Fib may want to seek out a specialist who is up-to-date in this field of research. 10. Observations of the doctor’s demeanor, approachability and listening skills. Is this someone you want to work with? Who understands how A-Fib makes you feel? Who inspires your trust? Download and save the FREE companion worksheet to “Choosing the Right Doctor: 10 Questions You’ve Got to Ask”. Print a worksheet for each doctor you interview.